And did anyone see the new SuperDraco engine test? Man, that was some fast throttling! Spyro, that post belongs here (and as you can also see here, the video of that test has been posted already). Press release about the SuperDraco qualification testing. You can watch the unveiling event live at 19:00et/03:00gmt on SpaceX's website, as Harb mentioned earlier. Just watched; that was really fantastic. Sleek, almost minimalist design, room for 7, and propulsive landing with redundant engines + chutes. "This is how 21st century spacecraft should land." Your videos aren't showing for me. I get this problem sometimes too, I think it's browser-related. Sometimes it will have problems with some Java stuff on this website. Try a different browser or reboot your PC, both things usually work for me. Anyway, they're just ones from SpaceX's Youtube channel, nothing exotic. V1 was just another capsule, and I never cared for it. I mean, what can it do that other capsules can't? What makes it functionally different? V2 is amazing- the engines for soft landing, the upgraded pilot interface; it even looks nicer. SpaceX is small, so Elon Musk can say "we should include ____ in our next spacecraft," and just like that the engineers can start working on it. There are less internal barriers at a smaller company, and I hope they never get too big- it will hurt their innovative ability. 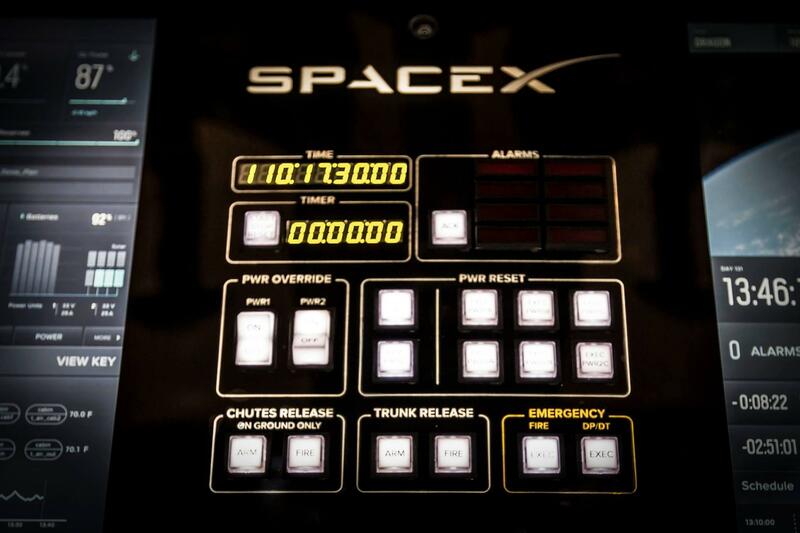 They have taken the disorganized mess of buttons and switches in the cockpits of real spacecraft and replaced it with some touch screens. They integrated engines into the capsule. They are turning spacecraft from complex machines where every mission has its own designation and freakin patch design, where you need years of training just to understand the dashboard, towards reusable machines that you can pilot without having 3 different degrees. It's a progression towards what everyone thought spaceflight should be like. This is what should be happening, and it seems like many were content with commonplace spaceflight to remain a pipedream. Privatization is hands down the best thing that will ever happen to the spaceflight industry. Look at it this way: V2 is so great that if this was a movie, ULA would be planning to hire people to sabotage the first V2 launch, and quite possibly an assassin to take out Elon. Generic movie plot conventions demand it! SpaceX is the biggest threat to the Orion(not a commercial spacecraft I guess) Boeing's CST-100 and SNC's Dream Chaser, which are modern day versions of the Apollo CM and lifting body concepts respectively. V2 is the only thing that looks like something new, where it's less of a "modern day _____". what can it do that other capsules can't? It is the largest capsule-type spacecraft ever to fly, and the only one which had the capability to transport large amounts of pressurized cargo both to and from space. It was also the first spacecraft ever flown to and recovered from Earth orbit by a private entity. Though it seems insignificant compared to V2, V1 is indeed a capable and historic craft in its own right. And I would say that while Dragon is clearly a direct and more appealing alternative to CST-100, I don't think the same is true of Dream Chaser. It's a complementary vehicle of very different design, and I believe it is marketable alongside Dragon. I for one hope they are both developed and see flight. CST on the other hand shouldn't progress any further. It is expensive, lacks innovation, and offers almost nothing that Dragon doesn't. There's no market for it, so the only people who would ever use it would be US government customers. Dragon and DC are both readily marketable to all potential customers based on their unique selling points and more affordable pricing. EDIT: Harb, you're right - a full reload (shift+reload) gets the videos working. Must be some caching error. Was going to post this, but you beat me to it! It was a great Q&A, a lot of really good info there. Infinite thanks to Helodriver and Chris at NSF for this existing and being public. That new SpaceX capsule is looking good. F9R development vehicle has flown again! This time it tested new deployable roll-control fins. First half of the video is the onboard camera view, second half is the ground-based view. Can't wait for the next F9 launch to see another landing test.